LOUISVILLE, Ky. — The International BoatBuilders’ Exhibition & Conference opened this morning with the Industry Breakfast & Awards Ceremony and a consistent theme of optimism and passion. From NMMA president Thom Dammrich’s welcome address to keynote speaker and NCAA champion basketball coach Rick Pitino’s motivational speech on the power of passion and a positive attitude, the more than 450 industry players in attendance heard a constant drumbeat that better days are ahead. 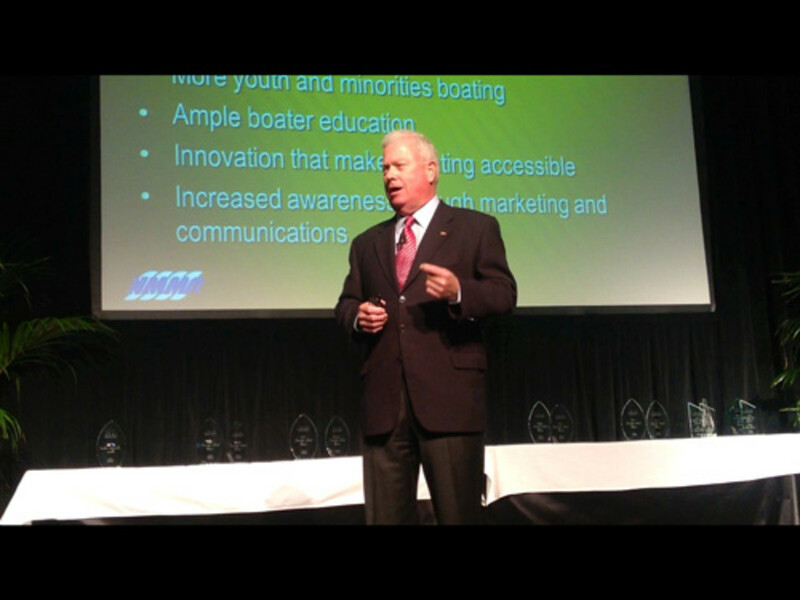 Dammrich echoed many of the themes he discussed last week at the Newport International Boat Show, urging everyone who makes a living in boating to be advocates for both their industry and the lifestyle; to reach out more to youth and members of minority groups to grow the sport; to focus on increasing hands-on skills training to shepherd in the next generation of boaters; and to continue to foster innovation in all facets of the industry. Dammrich cited $646 billion spent last year on outdoor recreation, which includes boating, as evidence of the value Americans place on it. Dammrich said annual retail unit sales remain far below the approximately 300,000 powerboats seen before the recession, but after plummeting 55 percent to 142,000 in 2010, sales crept up near 160,000 last year. “And as we turn to 2014 we expect to see even stronger growth,” Dammrich said, citing improvements in the Consumer Confidence Index (81.5 in August; Dammrich said 90 is the magic number for sales growth), the overall economy and the housing market. “The National Association of Business Economists recently forecast the second quarter of next year will see a return to 3 percent GDP growth, which is a very positive sign for us, and we expect by 2016, we predict, strong growth in new-boat production and sales,” he said.